A non-crystallizing silica (SiO2) suspension stabilized at an alkaline pH value of 9.8. The combination of very fine abrasive particles in a chemically aggressive liquid provides a Chemical-Mechanical Polishing (CMP) action. Ideal for final polishing to obtain a deformation-free surface. Obtain excellent results on IC-cross sections, ceramics, minerals, hard steels and ductile non-ferrous materials. Recommended as final polishing for EBSD samples. Supplied in 32 oz bottle (950ml) with a 40% particle concentration in water, pH range 9.7-9.9. PELCO® Colloidal Silica Suspensions are ideal for the final polishing of materials for which a high quality, visibly scratch free surface is required. 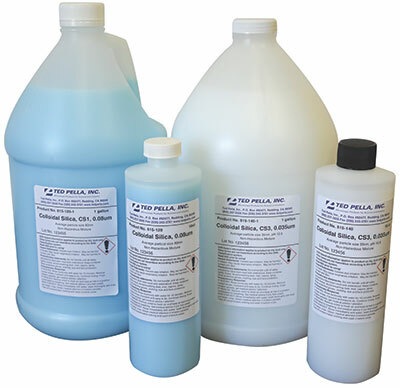 Three new formulations are provided, each with a specific average particle size and with increased alkalinity for an enhanced Chemical-Mechanical Polishing (CMP) effect. PELCO® Colloidal Silica CS1 with an average particle size of 80nm and pH value of 9.9 is ideal for many metallographic final polishing applications. PELCO® Colloidal Silica CS2 with an average particle size of 50nm and pH value of 9.9 formulated for fine polishing of semiconductor wafers and devices. PELCO® Colloidal Silica CS3 with an average particle size of 35nm and pH value of 10.5 formulated specifically for fine polishing of silicon wafers and devices.